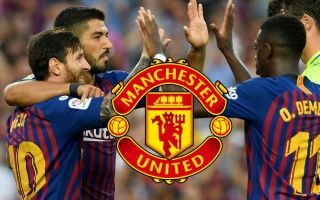 Barcelona midfielder Ivan Rakitic was linked with a transfer to Manchester United this summer and admits he held talks with some big clubs. However, the Croatia international added that in the end he was happy to remain at the Nou Camp, despite also attracting reported interest from the likes of Paris Saint-Germain and Juventus. When asked about United and other clubs, he said: ‘There was an offer, I did not say, some big clubs wanted me, but … I honestly, I talked to my wife and came to the conclusion that I was happy and proud to be part of this great club and defend the colours of Barcelona. Rakitic has been one of Europe’s finest midfield players in recent years, playing a key role in Barcelona’s success. The 30-year-old was also in superb form for his national team this summer as Croatia reached their first ever World Cup final, though they were then beaten 4-2 by France. Rakitic could have been a superb addition for United, who were known to be in the market for a midfielder of his type after Michael Carrick retired at the end of last season. The Red Devils ended up bringing in Fred but remained linked with the likes of Rakitic and other top players in his position like Real Madrid’s Toni Kroos and Lazio starlet Sergej Milinkovic-Savic.